From the outbreak of World War I on august 4 1914, Germany was entangled in a war on two fronts: with Russia in the east and with France, England and Belgium in the west. 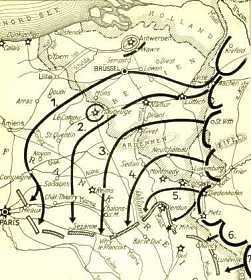 The German's attack-strategy was a part of the Schlieffenplan, which had the intention for the German army to beat France and England as quickly as possible. After that it could be launched at the east front against the Russians. The German army had to march right through Belgium in a large curve and then encircle and defeat the French army, as well as allied England, with its rightwing. After battles in Mons, le Cateau, the Marne, the Aisne and Ypres the German army was forced to a stand. The front stabilised at the end of 1914 when the armies were situated opposite each other and they entrenched themselves from Nieuwpoort in Belgium up tot Belfort at the Swiss border. The war in action came to a standstill turned into immobile trench warfare. In 1915 almost everyone, however, was convinced that the war would be over soon. Attempts were made to move the front and try to force a final breakthrough. England attacked in Neuve Chapelle, Aubers Ridge, Festubert, Ypres (where poison gas was used for the first time) and in Loos. France attacked in Artois and Arras and later on that year in the Champagne and in Arras once again; heavy combats also took place in the Argonnen area. However, they were all were futile and expensive actions without the slightest benefits for both parties, and in which German losses were often substantially less than on French and English side. The Germans were outnumbered at the Western front, but their strength lay in good organisation, in the quality of their defence and in their superior equipment with many heavy artillery and machineguns and sufficient ammunition. The allies had insufficient equipment, a shortage of heavy weapons and ammunition and poor communication-facilities. There were tactical weaknesses in the conduct of war; the English and French frontal attack-strategies could not survive the well organised defence-lines of the Germans, who were literally able to wipe out the attackers with their machine-guns. This all led to horrible casualty-lists: in the fall of 1915 only, these losses are an estimated 150.000 Germans and 250.000 allied. Both sides were convinced that the year of 1916 would bring the turning point. Germany was strengthened in that thought because it could spare troops at the eastern front where it had beaten Russia, in alliance with Austria. Both England and France would be able to bring in their strongest military forces in 1916. In England Kitchener's voluntary forces were built up and France would be able to add all its reservists and conscripts to the already existing army in the field and the war industry in both countries would also be able to contribute to the war-machine maximally. a joint operation at the river Somme. Preparations had already begun in 1915. The designer of the German plan of attack was General Erich von Falkenhayn, the German commander in chief, who had succeeded Von Moltke in 1914, who's campaign in Belgium and in France had failed completely. Falkenhayn's view was that it would be beyond German military possibilities to gain victory in an all-embracing, massive offensive. He considered England to be Germany's most important enemy who would lose its strength as soon as France, their most important ally, would be defeated. England would then withdraw from Europe’s continent and the unlimited submarine-war, putt into action by Germany, would force England on its knees in the end. It was for this reason that a war target had tot be found that would be so important to the French that they would be forced to deploy every man for the defence of that particular target, as they would never give it up voluntarily. Germany's aim would then be achieved: France would be forced tot sacrifice it's army till the last man and the last drop of blood and the French army would bleed to death (the Germans call this "ausbluten") and could then easily be defeated. Geographically this had to be Verdun. Apart from the psychological considerations, there also was a military consideration why to choose this particular place for a target of war. 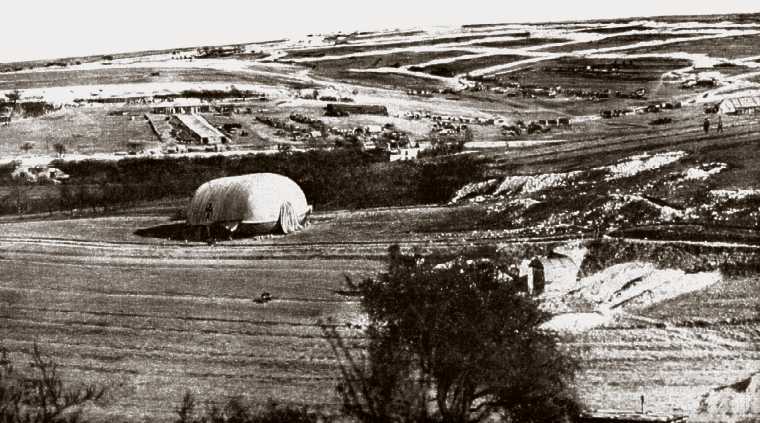 It was because Verdun was situated in a salient in the frontline as a result of which the Germans in a half circular-shape surrounded the battleground and this gave them a great advantage in their gunnery bombardments. On December 24, 1915 the decision was made to attack Verdun. The code name for this action was Operation Judgement (in German Judgement means: tribunal, verdict and execution as well). The attack was planned to take place on 12 February 1916. The German army was charged with the execution. This army normally stood under the command of Crown Prince Wilhelm, but de facto his Chief of Staff general Smith Von Knobelsdorf took the decisions. During the preparation-meetings two important issues came up for discussion. The leaders of the Vth army wished to launch an attack on both banks of the river Meuse simultaneously. 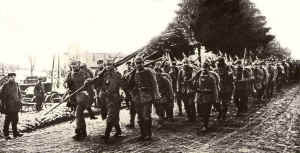 Falkenhayn claimed to have insufficient manpower at his disposal and therefore the attack had tot be restricted to the right riverbank of the Meuse with a relatively small deployment of ten German divisions. There also turned out to be a misunderstanding about the orders the army had received: the commanders thought to conquer the city of Verdun as quickly as possible, where Falkenhayn spoke in his orders of "an offence in the surroundings of the river Meuse, in the direction of Verdun." 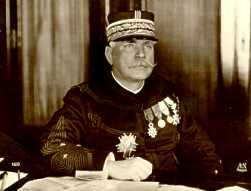 He only aimed at the destruction (weissbluten) of the French army and not in the first place, at conquering Verdun. 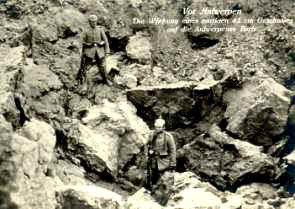 However, a direct attack on Verdun was launched because Falkenhayn thought the troops to be more motivated in a war of aggression rather than in a war of attrition. 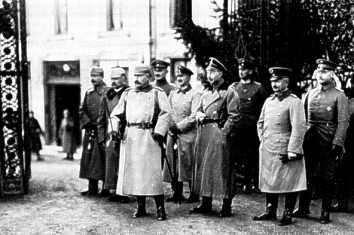 To maintain full control over the events all reserve-troops were put under the direct command of Falkenhayn himself and not under the command of Crown Prince Wilhelm. The German plan of attack aimed to destroy the French frontlines completely with the present field guns and the howitzers. The long-distance-guns should keep all supply-routes under fire to keep France from bringing in reinforcements. The firepower of 1200 German guns was tremendous, an ammunition-supply, sufficient for 6 days was at hand near the guns to a total amount of 2.500.000, brought in by 1300 ammunition-trains. The German preparations were made in all secrecy: entire villages situated in the occupied zone were evacuated in order to make room for five army corps, consisting of ten divisions with a total of 150.000 heads of attack-troops. Roads and railways were constructed for transportation. Accommodations were built, gun-emplacements were constructed, and heavy artillery was supplied. The area of attack with frontal latitude of 13 kilometres would be bombarded by more than 1.200 pieces of guns. Even the remaining army-units did not know much about the plans. All activities were immediately camouflaged and masked by aeroplanes that formed a solid defence line (for the first time in military history). The few French reconnaissance aeroplanes thus failed to conduct observations, also hindered by bad weather, and the observations they did bring in, were disregarded as being unimportant by the French Staff. As part of a new tactical plan of attack, the Germans also built special accommodations for the attacking-troops, the so-called 'stollen' that were situated at some distance from the frontline. In here, the attackers could wait in a sheltered position, for the right moment to attack. Before, attack-trenches were constructed which were almost always visible from the sky. This attracted artillery-fire and often led, even before the attack, to many losses. 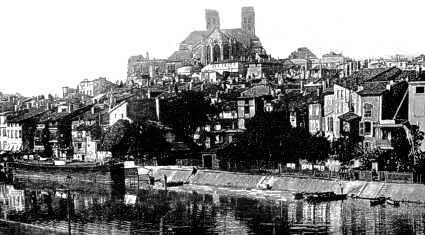 Verdun was a garrison-town situated in the Region Fortifée de Verdun (RFV) at the river Muese. It was surrounded by a double circle (largest diameter 50-km) of 20 big forts and 40 medium seized fortifications in a almost impenetrable hilly country, covered with woods, criss-crossed with deep clefts and gorges where the Meuse flows right through. In the outermost circle of forts, Fort Vaux and the dominant Fort Douaumont were situated, the cornerstone of the defence, towering high above the whole area at a height of 400 m.. In the innermost circle of forts, Fort Souville, Fort Tavennes and closer to Verdun Fort Belleville, Fort St. Michel, Fort Moulainville and Fort Belrupt were situated. The forts had been built in a sandwich like construction of reinforced concrete with a thickness of 2 meters, covered with layer of soil, with 2 meters of reinforced concrete on top of it. In the largest forts a detachment of soldiers of 500 men could be accommodated. The armament consisted of some heavy 155-mm. guns, placed in turrets, which could be lifted and machine-guns of heavy calibre. The forts were surrounded by concrete fortifications, equipped with machineguns for flanking fire and all connected by trenches. 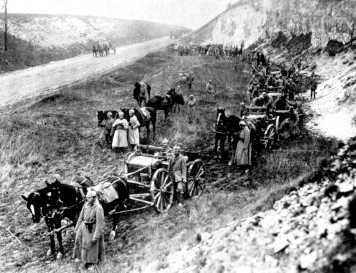 The defence of Verdun had been seriously neglected ever since the beginning of the war. At the fall of Liege and Antwerp in 1914 the surrounding forts were literally destroyed by the Germans and their Big Bertha's. The French supreme command therefore considered forts to be no longer useful to the defence and had them dismantled. The guns, as far as they could be displaced, had been brought elsewhere. The occupation of the forts had been brought back tot a minimum. The defences around Verdun were also seriously neglected. The frontline around Verdun was often no more than a ditch and sometimes the second en third defence-line were simply absent. Defence-trenches and barbed wire entanglements were often not laid-out. The armament of the Verdun-sector was minimal as well. There only were 270 pieces of guns available with too little ammunition (whereas the Germans had more than 1.200 pieces laid-out). 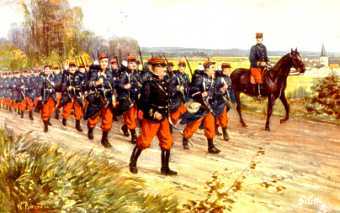 There were no more than 34 French battalions available at the moment of attack. The Germans could deploy 72 battalions consisting of seasoned frontier-soldiers. The general Herz, the commander in chief of Verdun, repeatedly plead for reinforcement of the lines, especially when it became clear from messages received from fled civilians and deserted Germans soldiers, that the Germans were preparing an attack on Verdun. The French Headquarters at Chantilly, which were under the command of commander in chief Joffre, however, paid no attention to the problems: 'Verdun is not a possible target', was their judgement. Also colonel Emile Driant, who later became known as the famous defender of the Bois de Caures, protested against the neglecting of Verdun lines. He pointed out the shortage of men and 'barbed wire in particular'. His report provoked one of Joffre’s legendary rages of fury but did not lead tot reinforcement of the lines. Only at the very last moment when it became clear that the Germans were planning something the Chief of Staff of the French army, general De Castelnau came to visit Verdun. He gave orders to reinforce the defensive line but too few men were available and supplies like barbed wire could not be brought in on time, so that the works hardly made any progress. To reinforce the army, two divisions were sent who only arrived at Verdun at February 12th, the date of the planned attack.